300-11(b). It appears smurf tubing is secured to the EMT. 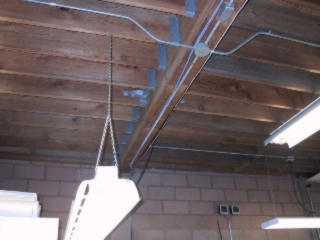 I would also call attention to the cord connected fixtures where the receptacle is not located properly according to Section 410-30(c) Electric-Discharge Fixtures. 3. Terminated in a grounding-type attachment plug cap, busway plug or have a fixture assembly with a strain relief and canopy.